1. A brother of Rabban Gamaliel, probably Gamaliel II. ; perhaps identical with Abba, a contemporary of Johanan ben Zakkai, mentioned in Peah, ii. 6. Besides Gamaliel's daughter, Abba had at the same time another wife; and when Abba died childless, Gamaliel married his widow, in accordance with the law of levirate marriage (Yeb. 15a). 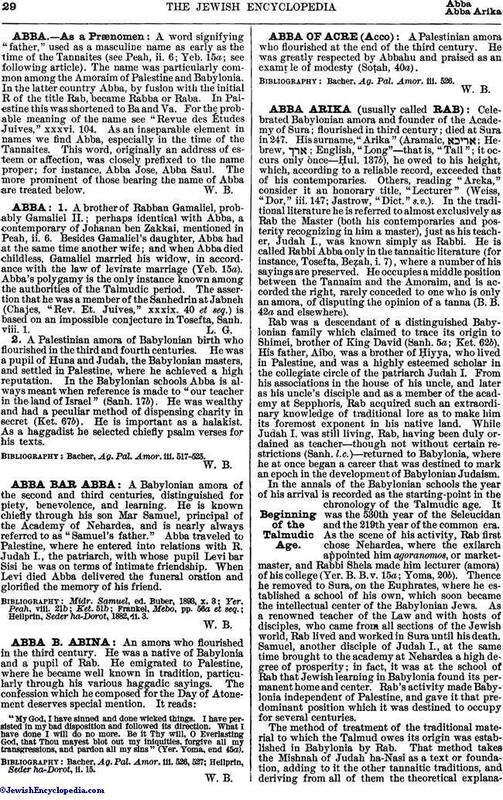 Abba's polygamy is the only instance known among the authorities of the Talmudic period. The assertion that he was a member of the Sanhedrin at Jabneh (Chajes, "Rev. Ét. Juives," xxxix. 40 et seq.) is based on an impossible conjecture in Tosefta, Sanh. viii. 1. L. G.
2. A Palestinian amora of Babylonian birth who flourished in the third and fourth centuries. He was a pupil of Huna and Judah, the Babylonian masters, and settled in Palestine, where he achieved a high reputation. In the Babylonian schools Abba is always meant when reference is made to "our teacher in the land of Israel" (Sanh. 17b). He was wealthy and had a peculiar method of dispensing charity in secret (Ket. 67b). He is important as a halakist. As a haggadist he selected chiefly psalm verses for his texts. Bacher, Ag. Pal. Amor. iii. 517-525.